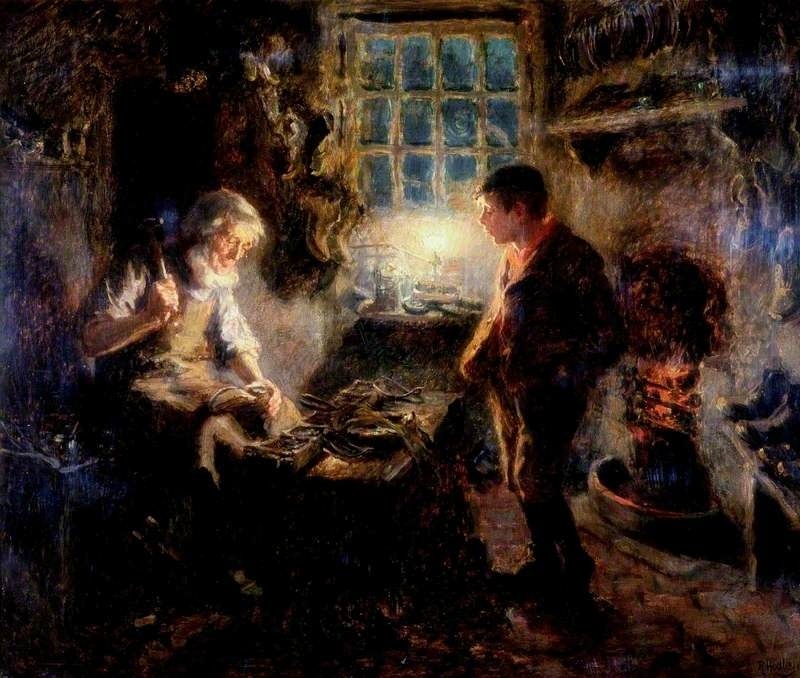 The Cobbler's Shop, by Ralph Hedley (1848-1913). 1909. Oil on panel, 45.7 x 55.1 cm. (see "Painting, Drawing and Print Database"). Courtesy of the Laing Art Gallery, Newcastle. Working by a small light in front of the window, the tools of his trade on the bench in front of him, an elderly cobbler is in the very act of hammering a heel onto a boot. A young lad looks on, hands in pockets, back to the fire. Perhaps he is or will become an apprentice. Another pair of boots and probably some other shoes are hanging at the left side of the window, and on the right-hand side, behind the boy and above the simple hearth, is a shelf from which more shoes hang. Other pairs are ranged on a bench below them, next to the fire. Lighting is an important part of this wonderfully atmospheric scene, in which much is half-hidden by shadow, so that only the figures are fully illuminated. Apart from the light, and the cobbler's white shirt and beard, touches of red stand out, from the boy's neckerchief, the glowing coals of the fire, and the flooring. There is energy here, as usual in Hedley, and a sense of life going forward, being transmitted through the generations. — Jacqueline Banerjee.